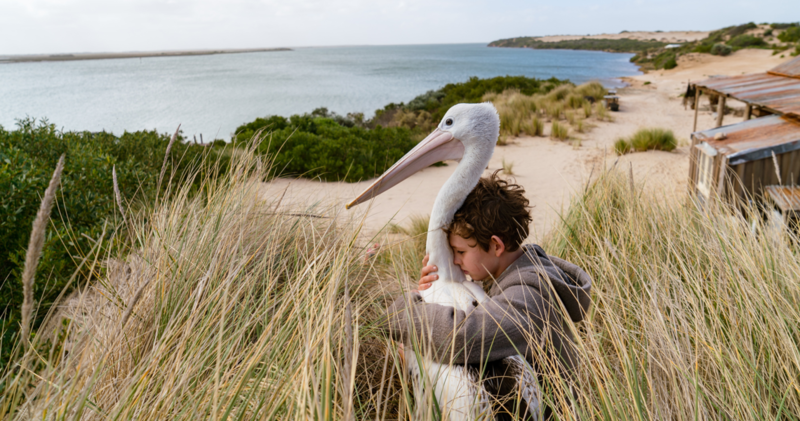 Film Summary: A beautiful and contemporary retelling of Colin Theile’s classic novella Storm Boy, this story set in South Australia’s remote Coorong National Park has enchanted Australians for over half a century. STORM BOY has grown up to be Michael Kingley, a successful retired grandfather (Geoffrey Rush). When Kingley starts to see images from his past that he can’t explain, he is forced to remember his long forgotten childhood, growing up on an isolated coastline with his father. He recounts to his granddaughter the story of how, as a boy, he rescued and raised an extraordinary orphaned pelican, Mr. Percival. Their remarkable adventures and very special bond has a profound effect on all their lives. Based on the beloved book, STORM BOY is a timeless story of unusual and unconditional friendship. [This] version of Colin Thiele’s 1964 book about the relationship between a pelican and the son of a beach-dwelling hermit not only compares favourably with the original, it often outdoes it, offering more story and substance. Rush gives a commanding performance as the older Storm Boy, and there’s an appealing contribution from Davies as his passionate granddaughter. Themes of loss, grief and separation are pitched at just the right level to resonate with children and adults alike.